MANILA, Philippines - MTV has released its Best Band Style of 2012 list and it includes K-pop bands 2NE1 and Big Bang of YG Entertainment. 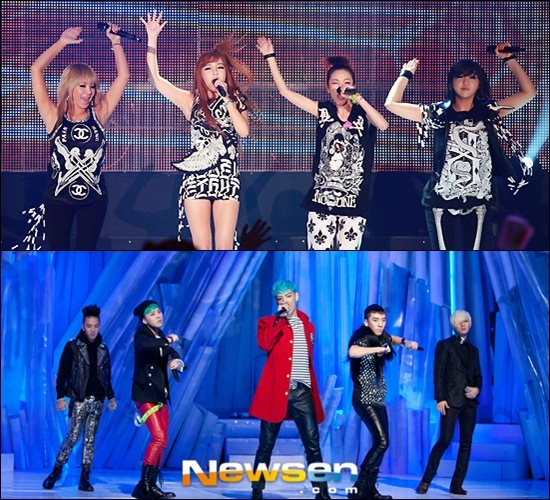 Europeans also voted for their favorite K-pop artists and 2NE1 and Big Bang emerged as the best bands this year. "It's one thing for individuals to have exemplary style. But it's another thing entirely for a band (of multiple people!) to pull off individual outfits but still look cohesive. With the epic resurgence of boy bands (thanks, One Direction and The Wanted) and plenty of OG comeback stories, the well-dressed ensemble group was not that rare a thing this year," wrote MTV. Groups chosen by MTV as having the Best Band Style of 2012 are One Direction, The Wanted, Spice Girls, Backstreet Boys, Destiny's Child, 2NE1, Big Bang, Fun., Haim and No Doubt. "K-pop had a GIGANTIC year in 2012, partly because of 'Gangnam Style' and partly because the genre is CHOCK FULL of boy bands and girl groups. MTV Style has a soft spot for 2NE1 thanks to their propensity for all things bold and colorful and their enviable closeness with Jeremy Scott," according to MTV. MTV described Big Bang's style as bold and colorful. "We are OBSESSED with Big Bang. The K-pop boy band is a five-dude unit of unbridled energy, hyper-saturated streetwear, tonsorial risk-taking, and uhh, they wear MINX NAILS SOMETIMES. *faints*," the website said. The winners for this year's So-Loved Awards by K-Colors in Korea magazine in Europe were announced. For this year, a total of 307,086 votes and 110,984 European votes were received but only the European votes were counted. For the best female band, 2NE1 was the winners with 45.2 percent of the votes, followed by f(x) with 12.5 percent and Secret with 7.7 percent. Big Bang was picked as the best male band with 30.4 percent of the votes, followed by Super Junior with 22.6 percent and SHINee with 10.9 percent. G-Dragon, leader of Big Bang, also won as male solo artist, garnering 52.9 percent with JYJ's Junsu in second place with 22.2 percent and Tablo with 10.7 percent. G.NA bagged the female solo artist award with 30.8 percent with Ga In in second with 29.4 percent and Ali in third with 16.7 percent. Europeans also chose Big Bang's "Fantastic Baby" as the best song this year, followed by B.A.P's "No Mercy" and Block B's "Nanlina" with 17.2 percent. "Rooftop Prince," which starred JYJ's Yoochun, was voted best drama with 28.1 percent, followed by "Shut Up! Flower Boy Band" (27.9 percent) and "Reply 1997" (21.5 percent). Here's the complete list of winners in the So-Loved Awards.